Lowell Spinners to give out 1000 Jack Kerouac bobbleheads at August 7, 2012 game. LOWELL, MASS. — The Lowell Spinners, Class-A Affiliate of the Boston Red Sox, in conjunction with the UMass-Lowell English Department have once again teamed together to salute Lowell's own Jack Kerouac, announcing this week a two-part bobble head plan. The Lowell Spinners have previously made headlines with a Jack Kerouac Bobble Head Giveaway in 2003, with the line stretching up to the University Bridge, the bobble head eventually found its way into Cooperstown's Baseball Hall of Fame. On the heels of the upcoming On the Road feature film, the Spinners are once again set to honor Kerouac over each of the next two seasons. 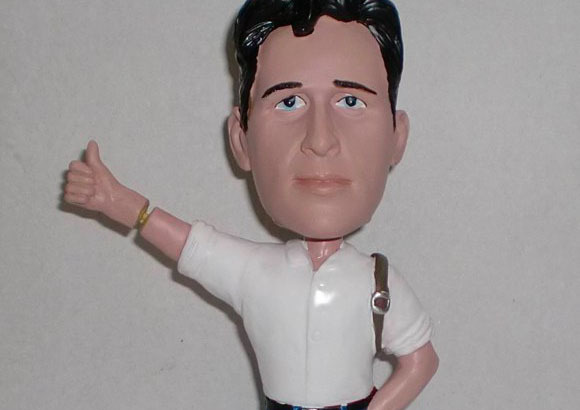 The team will get things started Tuesday, August 7 with a Kerouac double bobble, with a bobble head and arm, signally Jack's hitchhiking adventures in On the Road. The doll will be available for the first 1,000 fans through the gates, courtesy of the UMass-Lowell English Department, as well as an online opportunity for fans unable to attend the game. Those fans will be able to purchase the doll, beginning Tuesday afternoon for $20, with $10 of the purchase price going to the Kerouac Scholarship Fund. The online sale will also be limited to 1,000 bobble heads. Dolls can be purchased by clicking HERE. "We are so thrilled to be able to honor one of Lowell's favorite sons once again with this unique double bobble of Jack," said Spinners Vice President of Public Relations and Promotions Jon Goode. "With the initial bobble head, we had a map of the world with pin points from all of the requests. Adding the opportunity for fans from outside the region to get a doll, while also contributing to the Kerouac Scholarship Fund is a win/win for all involved!" The team isn't stopping in 2012 however, as plans are already in place for a to-be-determined 2013 home game to complete the Kerouac Bobble Head series with Jack in his Lowell High School football uniform. "Anytime we can lean on the great history of Lowell and add a Spinner flair to it, it is an opportunity we can not resist," said Goode. Bobble Heads can be pre-ordered for fans not able to attend the game or tickets can be purchased for the game itself by clicking HERE or by phone at (978) 459-1702.